Introduction: EVA backing, coating on both sides with strong solvent acrylic adhesive. PE plastic film/Yellow silicone paper/White silicone paper/Glassine silicone paper as release paper liner. Good and strong adhesive. Widely used for wall-mount pictures, decorations. And can be used on most types of walls, ceramic tile and wood surface that are clean and dry. 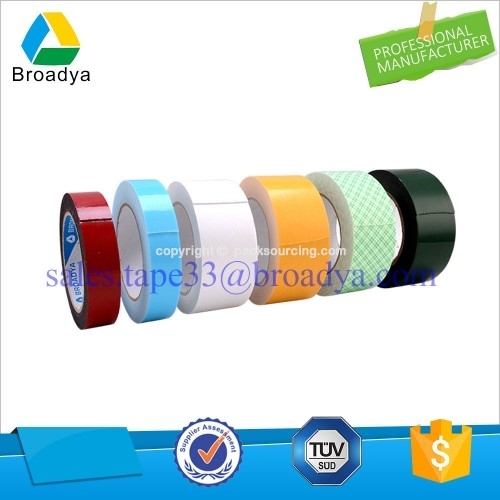 MAIN USAGE: For general purpose, nameplates, leather products, computer embroidery, foam lamination, paper splicing, membrane switches, die cutting, furniture parts, automotive parts, electronic products, home appliance etc.